Beyonce is set to return to HBO, with husband Jay Z.
HBO will premiere “On the Run Tour: Beyonce and Jay Z,” which will feature the couple in their first collaborative tour, in September, the network announced Thursday at the Television Critics Assn. summer press tour. The special will tape Sept. 12 and 13 at Stade de France in Paris on the only international leg of the married couple’s current tour. More HBO news, “Boardwalk Empire‘s” eight-episode fifth and final season will premiere Sunday, Sept. 7. 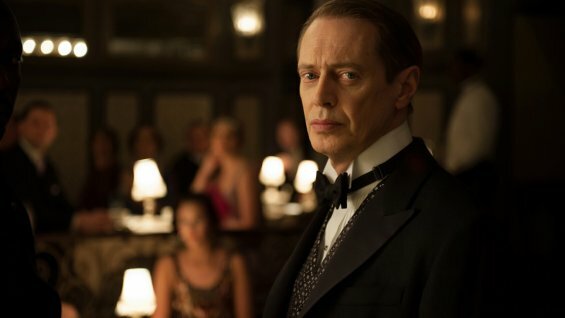 Set in Depression in 1931, the season follows Nucky planning for his his post-Prohibition future. Can’t wait for the final season? Watch the teaser below. Beyoncé’s new documentary “Life Is But A Dream” will definitively address the nasty rumors she was subjected to during her pregnancy. In the second trailer released by HBO, Queen B struggles on how much she reveals about herself and her pregnancy. “They keep putting me in these tight clothes and trying to hide [the pregnancy]. It’s very difficult. I don’t know how I’m going to get through this. “Life Is But A Dream” airs on Feb. 16 on HBO. Will you tune in? HBO is scheduled to air a documentary featuring Beyoncé, Michael Lombardo, president, HBO Programming announced Monday. HBO will air an intimate documentary film featuring multiple grammy®-winner, entrepreneur and actress Beyoncé. The documentary is set to air Feb. 16 2013. TV Weekly News: ‘Copper’ Renewed, ‘666 Park Ave’ ‘Last Resort’ & ‘Mindy Project’ Receive Additional Episodes Orders And More! BBC first original series “Copper” has been renewed for a second season. “Copper,” from executive producers Barry Levinson and Tom Fontana, has been picked up for a sophomore season of 13 episodes, that is three more episodes than the first season. The first season finale airs this Sunday on BBC America. NFL announced Tuesday that Beyonce will perform during the The Super Bowl’s halftime, which is set for Feb. 3, 2013 at the Mercedes-Benz Superdome in New Orleans. Fox freshman comedy “The Mindy Project” have received an additional two episodes order plus ‘ the full season pick up, bringing the series to a season of 24 episodes. ‘Teen Mom 2′ returns on Nov. 12 for its season 3 on MTV at 10/9c. TNT has ordered a season of six-episode of a new untitled series from executive producers Frank Darabont (“The Walking Dead”), Michael De Luca (“The Social Network,” “Moneyball”) and Elliot Webb (“Tall Time Tales”). The series which is based on L.A. Noir: The Struggle for the Soul of America’s Most Seductive City by John Buntin, stars “Walking Dead‘s” Jon Bernthal as an ex-Marine now working as an LAPD cop in an era rampant with police corruption. “America’s Next Top Model” has been renewed for a 20th cycle, which will include male aspiring models. “Shahs of Sunset’s” second season will debut Sunday, Dec. 2 at 10/9c on Bravo. “Being Human’s” third season of 13-episode will premiere on Monday, January 14 at 9/8c, it was announced today. “Psych” seventh season will premiere on Feb. 27 on USA. “Bachelorette” Ashley and J.P.’s Wedding will air this December, ABC announced earlier this week. Syfy has released a teaser of “Defiance,” which premieres April 2013. Take a look below.